For the era of gaming it was released, R.C. Grand Prix was pretty spectacular. 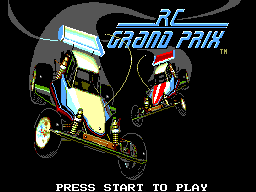 It had featured quite a dynamic AI for the generation, plus the controls weren't too difficult to manage. 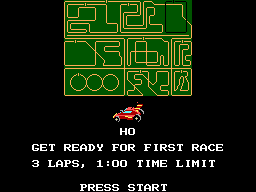 However, the game overall is fairly difficult for a racing game and it is not one I would recommend for a beginner. Starting out, you have a square circuit, simple, but not easy. You won't get more than 110 dollars, not even enough for any parts. You have to win or get second place in the majority of races, of which there are ten, to be able to buy parts, which are expensive for a racing toy. Parts: Motors, Gears, Tires, Suspension, Batteries. Two to three levels for each part, minimum cost $120. Conditions of racing: To move on you must place third or better, and not run out of time. Multiplayer type: One player switch; Player one races, then Player two, then three, then four. 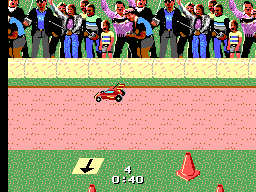 If one player loses, that car becomes AI controlled. Oh, when a part gets installed on one car, that car when controlled by the AI will behave accordingly, making it harder on the other players because the stock count of any given part is one. Once bought, another player cannot buy the same part until after the next race. Another problem is this; the courses (with one or two exceptions) are intertwined; you can go off course if you aren't careful. The graphics are quite good; the part shop background looks like an actual picture rather than a drawing. The details of images like the parts are very clean, as are the cars. The music and sound are very clean, not poppy or staticky. Though the engine sound is kinda droning after a bit because of the ADPCM limitations. The controls aren't too difficult, but it is easy to over or under steer and hit walls or worse, go off course. As far as I can tell, no brakes. Overall, very frustrating, very addictive. Definitely one to keep, and play again and again. This is a good game, one I do recommend. However, if you're looking for a game for your four year old, this isn't it. I would recommend this to someone who is good with racing games, or someone whose well experienced with several different types of controllers. But by all means, if you want a multiplayer party game, thus is a good one, even for those drinking games.